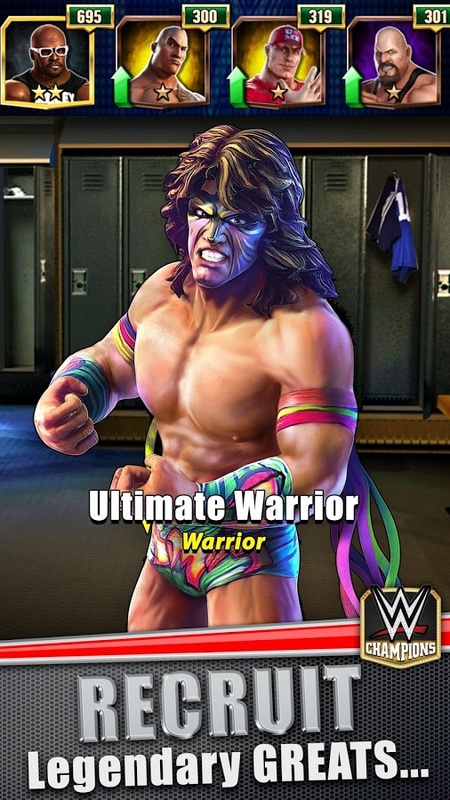 Your dream rivalries are happening live in WWE: Champions, the free RPG that pits the WWE’s greatest Superstars against each other in the ultimate quest for stardom. 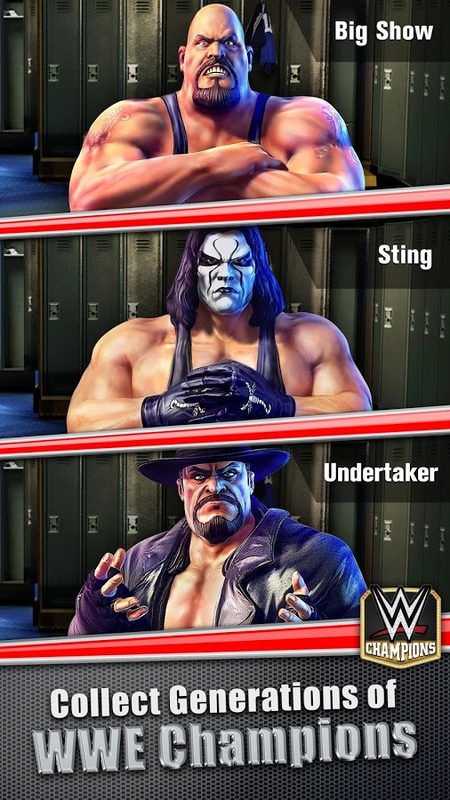 Create and customize your team of Superstars, and battle them through the generations of the WWE’s greatest. Think you’ve got the best team? Prove it! Send your team into the PVP ring and test your fighting skills. Win, and your champions will live on as immortals. Lose, and face defeat at your opponent’s hands. The fast-paced wrestling action is easy to learn and rewards skill and quick thinking. Come join a community of fellow WWE fans battling for reputation, power and bragging rights in WWE: Champions! Travel the history of the WWE and assemble your dream roster of champions from the 80s, 90s and modern era. The Rock, Undertaker, Macho Man Randy Savage, John Cena, Triple H, Big Show, Andre The Giant and more are ready to enter the ring. Earn XP from fighting in the ring and upgrade your champions to increase their power and customize epic moves. Combine a wide variety of skills and upgrades to create a completely unique team. Team up with friends and tag team against rivals, or turn heel and fight against them for bragging rights. Just like the WWE, Champions is evolving year-round. Join the community in weekly bouts that re-create upcoming Smackdown and Raw battles, enter monthly title events, and recruit up-and-coming Superstars. Experience a unique puzzle take on the WWE. Match puzzle pieces to attack, build up energy and even pin your enemies using signature wrestling moves. Think fast and play skillfully to unleash devastation on your enemies in epic battles that you can finish in less than five minutes anytime, anywhere. End games and obliterate rivals with signature moves like John Cena’s Attitude Adjustment and The Rock’s legendary Rock Bottom. Marvel at powerful upgraded moves that will have your enemies scrambling for safety. WWE: Champions is the ultimate puzzle RPG. 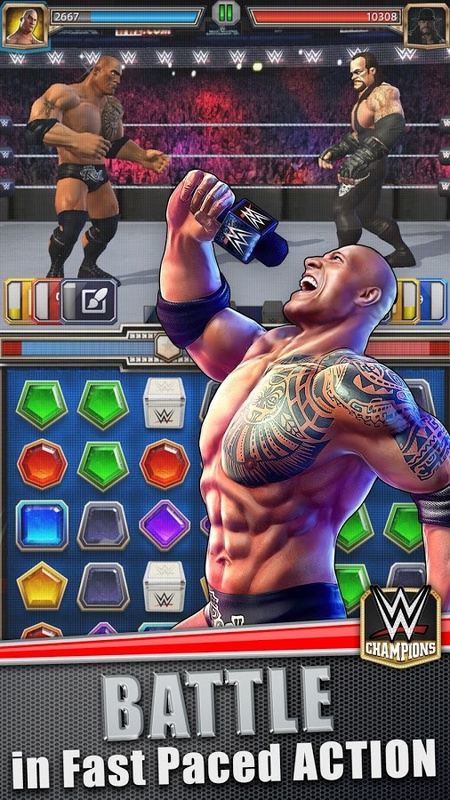 Become a promoter in the brutal world of the WWE, play puzzle games to fight your rivals, and collect new Superstars to build the ultimate team. Bring your dream rivalries anywhere with WWE: Champions. Download for free and start battling today!